The North Port Huskies Athletic Association is a non-profit organization located in North Port Florida. It offers youth cheer and football to children in and around Sarasota, Charlotte and Desoto counties. 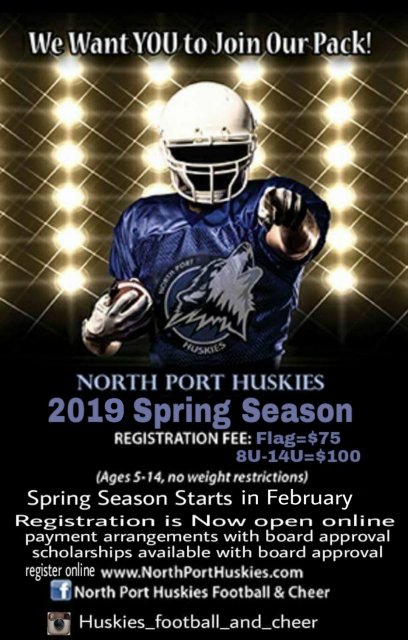 The Huskies are the elite youth football venue in our area and represent North Port throughout Florida in tournaments with teams around the Nation. All sponsorships and donations are greatly appreciated and will help to create a better foundation for our local youth. Everyone Plays! Cheer and Football are open to all children with no weight restrictions. No tryouts and children go through a training process educating them on techniques while building endurance and stamina. Minimum plays are counted each game ensuring fall participants play. Children are expected to keep grades up to participate. This organization is family oriented and parent participation is vital in order to continue succeeding! North Port Huskies pride themselves on integrity and character, holding all members involved to good character conduct creating a dynamic that is inspiring to the children and everyone involved. The North Port Huskies cheer and football has two seasons, spring and fall. Spring runs mid February to mid May. Spring season we play with independent leagues. Fall season begins mid July and end early November The Southeast Regional Championship game is held late November and early in December Nationals game is held. Fall season we are members of the AYF association.